The U.S. Department of Labor is distributing this poster to promote National Disability Employment Awareness Month. National Disability Employment Awareness Month, which is held each October, celebrates the contributions of workers with disabilities and raises awareness of disability employment issues. The Postal Service, like other organizations across the United States, is recognizing the contributions of employees with disabilities within its workforce. 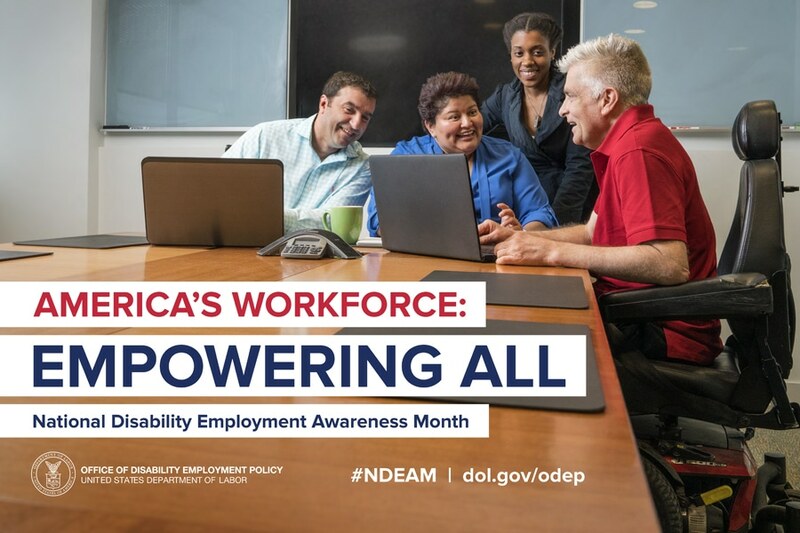 You can learn more on the U.S. Department of Labor site’s National Disability Employment Awareness Month page, which has a downloadable poster and other materials, as well as a history of National Disability Employment Awareness Month. The Postal Service’s National Disability Program Blue page also has information, including a National Disability Employee Awareness Month resource kit. This entry was posted in General Union Business and tagged America’s Workforce: Empowering All., disability employment issues, disabled employees, DOL, National Disability Employment Awareness Month, NDEAM. Bookmark the permalink.